Fisherman's cabin sits on a private lakeshore, surrounded by forest in beautiful Dordogne, SW France. The cabin is off-grid and we use alternative energies to provide mod-cons. Fisherman's Cabin was named by The Times as one of the top 20 remote escapes in Europe (2015). When you stay in a cabin, nature is all around you - the perfect de-stress holiday. Built from local timber and recycled materials, the holiday cabin looks out over the lake and surrounding forest where nature abounds. Inside, the cabin has a warm cosy feel, and is well equipped with everything you need to help you make the most of your stay. Bike hire is available so you can explore the pretty local villages, or chill out on the raft, listening to the frog's chorus and watching the fish jumping. The cabin is surrounded by mature forest, there are lots of well marked bridle paths for walking/cycling. The landscape of rolling hills provides pasture for cattle and agriculture,there are markets in the nearby towns of Nontron and Piegut-Pluviers, and bathing lakes nearby. 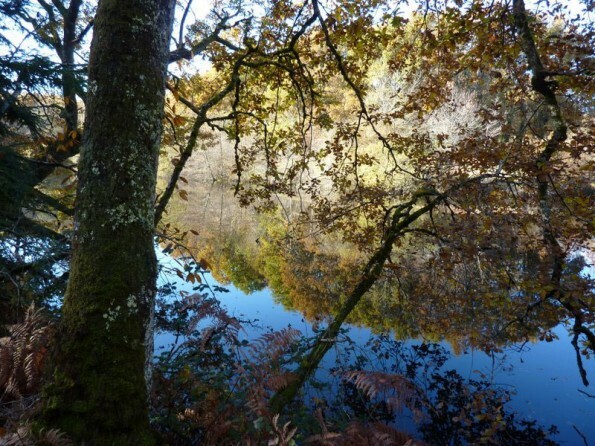 There are beautiful walks through the forest that will take you to quiet, sleepy hamlets and you're still within easy cycling distance of local restaurants, bars & shops. The markets are a splendid way to sample the world-famous local produce and you'll find the people friendly & relaxed. 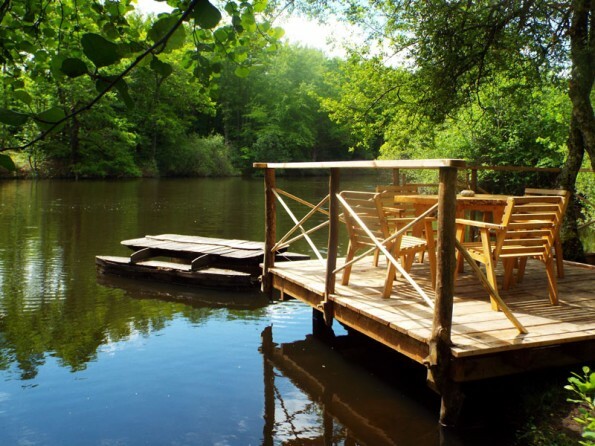 Alternatively, you could spend the day drifting around the lake on the raft, or maybe even enjoy some "wild swimming"! Budget airlines fly from several UK airports to Limoges. Train to Angouleme. Car hire is available at the airports or train station. This little oak-framed building was built entirely from timber from our own woods, even the doors, windows & some of the furniture! The cabin is furnished with a mixture of junk-shop gems and recycled bits & bobs. Downstairs there is the main living area, galley kitchen, wc and showerroom and double bedroom. Up the "zero-emissions" staircase is a mezzanine style bedroom with 2 single beds with views over the lake. The kitchen is well equipped. There's a little library with an eclectic mix of books including guide books and maps and also binoculars and a compass. If the surroundings inspire you then we've provided some art materials, as well as some board games for passing a rainy day. Outside, there's a deck oversailing the water which provides the perfect vantage point for nature watching. Fisherman's Cabin lies around 3 kilometres from the villages of Augignac and St Estéphe and about 6 kilometres from the town of Nontron in the northern Dordogne. Other villages and hamlets are nearby & nearly all are accessible by bridle paths. This is a traditional can holiday in that there is no television, no dvd or cd players. A wind-up radio is your contact with the outside world, nature will provide all other entertainment free of charge! The variety of flora & fauna around the cabin is astonishing. Sit quietly and you'll see, amongst others, deer, pine martens, stoats and possibly even wild boar! The lake is home to our own coypu (like a beaver), kingfisher, buzzards, herons, owls and numerous varieties of dragonflies & butterflies.